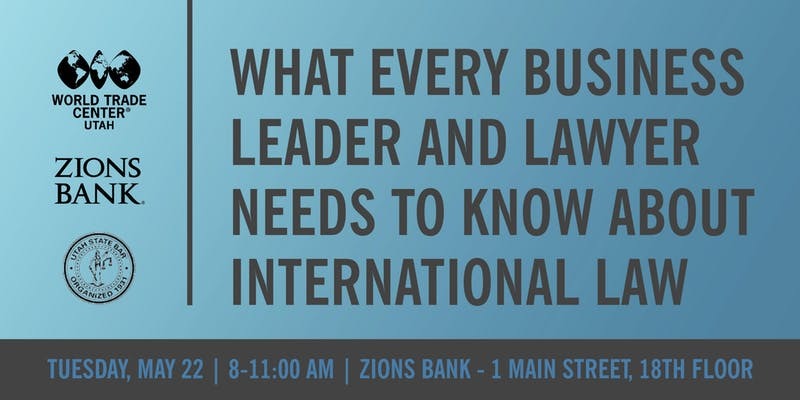 JOIN WORLD TRADE CENTER UTAH IN PARTNERSHIP WITH ZIONS BANK AND THE UTAH STATE BAR ON TUESDAY, MAY 22ND AT 8 A.M. FOR A SEMINAR ON INTERNATIONAL LAW. When: Tuesday, May 22 at 8:00 - 11:00 a.m.
CLE: Approved by the Utah State Bar for 3 hours of CLE. This seminar will feature a panel of 5 attorneys who will present on various international law topics such as: export controls and sanctions, contract provisions, intellectual property, the Foreign Corrupt Practices Act, and EU anti-monopoly laws. 3 credit hours for CLE will be given for attending. Parking: Parking is available using City Creek Center parking. Please ask the reception desk for a validation if you park in the City Creek Center parking garage.